SSi provides flow measurement and control technologies to meet the demands of rugged industrial environments. 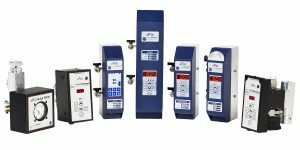 The eFlo flow meter is available with multiple configurations: motorized, automatic control valve; manual control valve; no control valve; and totalizer-only. Depending on the model ordered, eFlo features a digital display with touch keypad, direct and remote setpoint control with built-in alarms, Modbus communications, digital and analog I/O, USB and Ethernet connectivity, onboard datalogging, and mobile device capability. An analog gauge meter is also available.